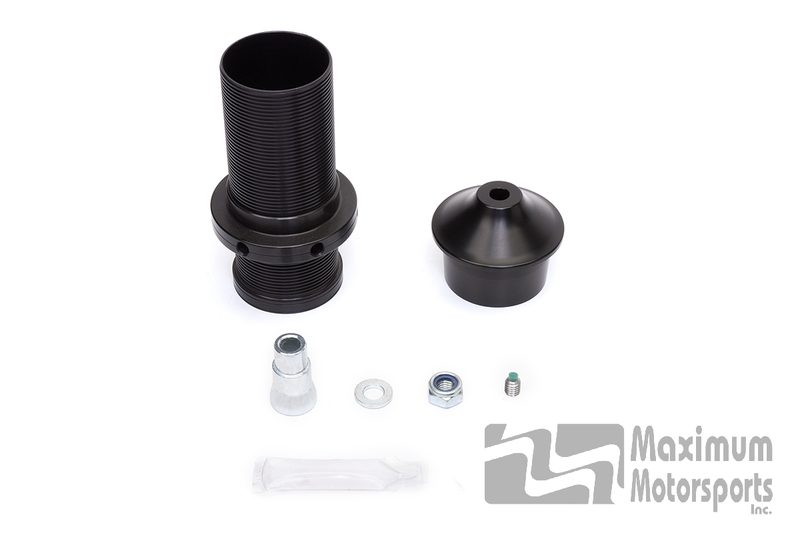 This coil-over kit will install 1 Black Series MM Shock in a 1979-2004 solid-axle equipped Mustang along with an MM Racing Upper Shock Mount. Attaches the MM shock to the MM Racing Upper Shock Mount installed on the chassis. Includes threaded coil-over sleeve and upper and lower spring perches for 1 shock. For coil-over applications and an MM Racing Upper Shock Mount only. Does NOT include MM shock, MM Racing Upper Shock Mount, or coil-over spring. Purchase those items separately. 1 kit fits 1 shock. 2 kits required per car. Fits Black 3rd Gen MM shocks only (NOT included). These shocks are black and have a shaft with a 5/8" major diameter. 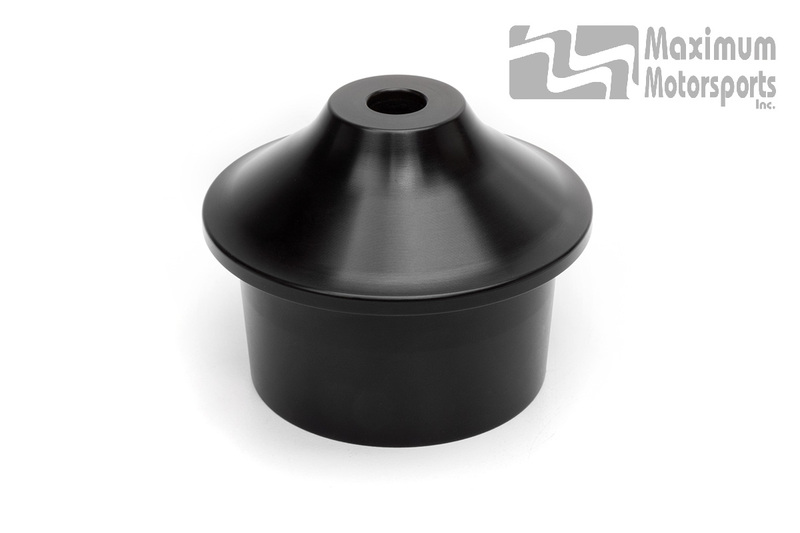 The Black Series is the third generation of MM shocks. Includes Street-ST1, Sport-SP1, Race-RA1, and Race-RA3. Requires MM Racing Upper Shock Mount (NOT included). Requires 2.25" coil-over spring (NOT included). 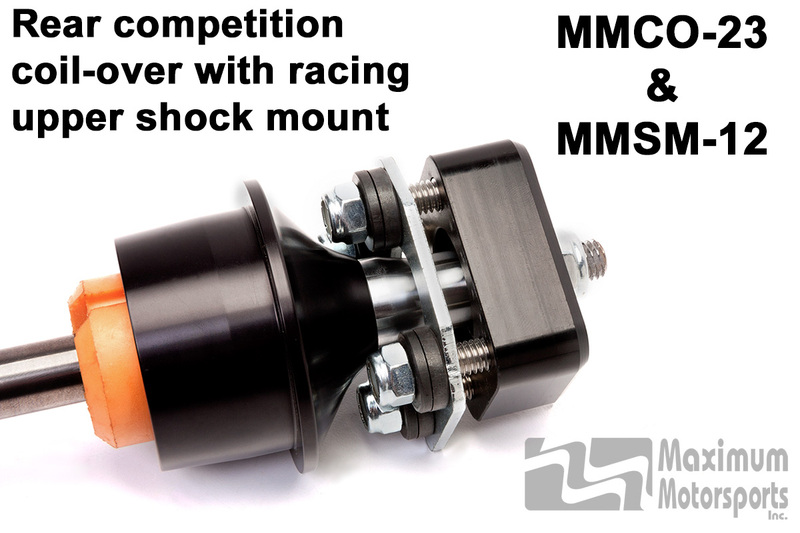 For new installation use MMSM-12 Racing Upper Shock Mount. Also fits previously installed Racing Upper Shock Mounts MMSM-1, MMSM-3, and MMSM-5. Some of the previously installed components of those kits will not be reused. Coil-over installation requires a robust lower shock-to-axle mounting bracket. If you have an MM Panhard Bar, the axle mount does double duty as the lower shock mount for the driver side. Click here to order 1 shock-to-axle mounting bracket (MMSM-2) for the passenger side. If you don't have an MM Panhard Bar, click here to order 2 of the shock-to-axle mounting brackets (MMSM-2). A spanner wrench is necessary to adjust ride height when using springs with a rate less than 250 lb/in. Springs with a higher rate rarely need a spanner wrench for adjustment. Click here to order 1 MMT-2 if your spring rate may require a spanner wrench. 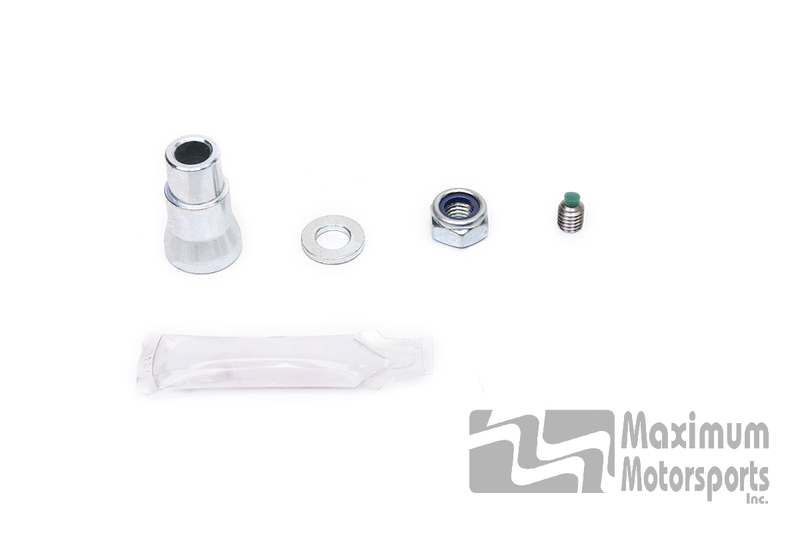 For non-coil-over applications use MM Upper Shock Mount Installation Kit MMSM-20. Includes all coil-over conversion parts, except the spring, to install 1 Black Series third-generation MM shock, along with an MM Racing Upper Shock Mount, for a coil-over conversion in 1979-2004 Mustang chassis equipped with a solid axle. Order 2-1/4" coil-over springs separately. Fits 1 shock. 2 MMCO-23 kits required per car. 1 shock. 2 MMCO-23 kits required per car. Black Series third-generation MM shocks. These shocks are black and have a shaft with a 5/8" major diameter. Black Series part numbers have this format: MMD-RC1xxxx. MMSM-1, MMSM-3, and MMSM-5 Racing Upper Shock Mounts. Some of the previously installed components of these kits will not be reused. If you have an MM Panhard Bar, the axle mount does double duty as the lower shock mount for the driver side. Only 1 shock-to-axle mounting bracket (MMSM-2) is required for the passenger side. If you don't have an MM Panhard Bar, you'll need 2 of the shock-to-axle mounting brackets (MMSM-2). Yellow Series 2nd Gen MM shocks, which have a yellow shock body. Yellow series requires MMCO-21. MM 1st Gen yellow shocks having a shaft with a major diameter of 11mm. Any shock other than the Black Series third-generation MM shocks. Black Series part numbers are in this format: MMD-RC1xxxx. Mustangs without MM Racing Upper Shock Mounts. MMSM-2 does NOT include the lower shock mount bolt (12mm by 70mm, grade 10.9) and matching nut. We are working on FAQs for the MMCO-23 Coil-over Kit. If you have a question, please use our Contact Us page to email your question to us. We will answer your question by return email, and also consider your question for possible addition to this FAQ section. You can read Maximum Motorsports' highly detailed MMCO-23 Competition Coil-over Kit installation instructions before purchase.